Hanging 2 Side Wooden Address Plaque with Big House Numbers -- and pine tree accents. Carved wood sign is personalized just for you. Ready to hang from your own post or bracket. Made in USA. 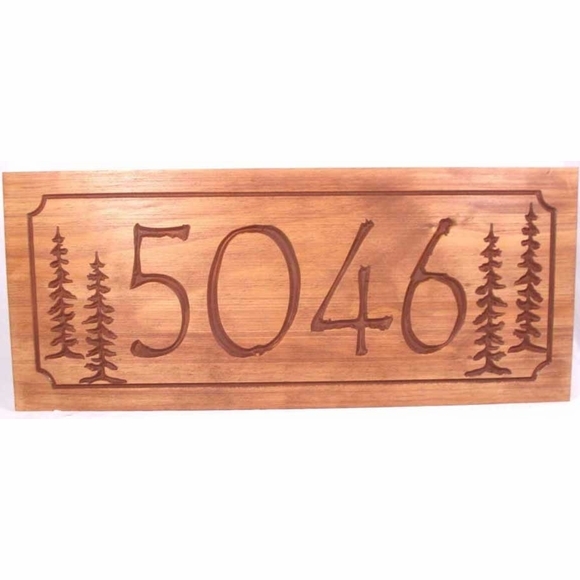 One line pine tree address sign perfect cabins and rural roads. Free personalization. Includes two tall pine trees on each side. Solid pine construction with carved personalization, pine trees, and thin border. Four sizes: 22"W x 9"H x 3/4"; 24"W x 11"H x 3/4"; 22"W x 14"H x 3/4"; 26"W x 16"H x 3/4". 22x9 sign holds up to six (6) large numbers. 24x11 sign holds up to seven (7) large numbers. 22x14 sign holds up to six (6) large numbers. 26x16 sign holds up to nine (9) large numbers. Please make sure to order the sign size that is big enough to hold your house number. (NOTE: you do not have to fill the entire input box.) Leave the three unused input boxes empty. Finish: rustic brown with clear-coat marine-grade sealer. Text and carved portions are painted medium brown. The overall wood grain is captured and highlighted with a variety of brown tones, which creates an overall rustic look. Each sign is a one-of-a-kind unique piece as the highlighted wood grain is different with each piece of wood. Includes two eyelets to help with hanging the sign from your own bracket. The wall mount version of this pine wood sign with big numbers is also available. Click top link in Related Products for details.